NECA's Randy Falk on developing one of the most impressive figures yet for Deadpool! 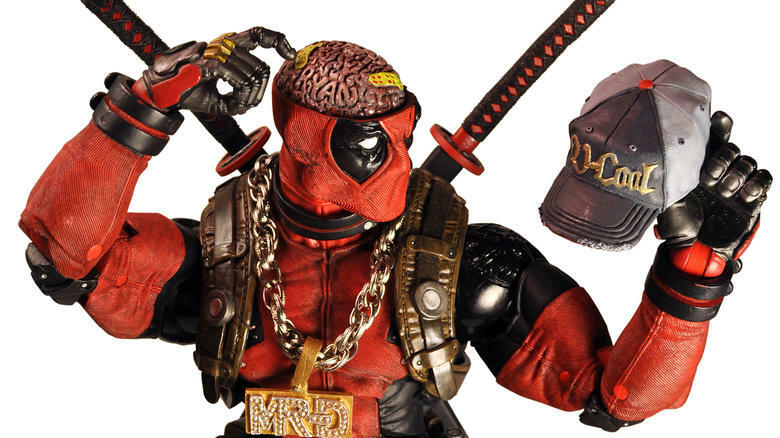 The Merc with a Mouth has one of his most impressive figures ever now available, via NECA’s recently-released Marvel Classic – 1/4 Scale Action Figure – Ultimate Deadpool. 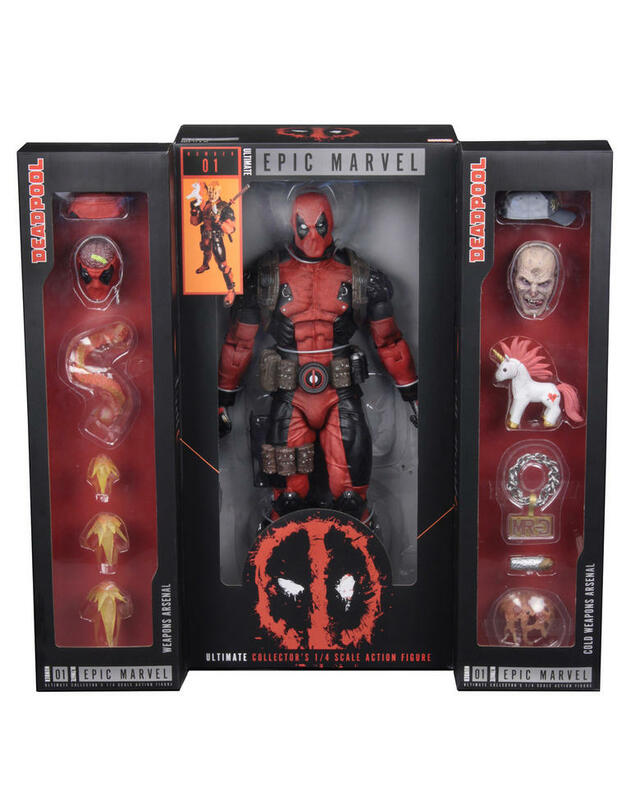 The figure is notable as NECA’s first ever Ultimate quarter scale action figure, standing 18” tall, and is loaded up with accessories, including the multiple weapons you’d expect for Deadpool, but also everything from a “MR-D” medallion necklace and “DPUL” rings; to a baseball cap; melted cheese pizza toppings; a unicorn; and, of course, a chimichanga. The Marvel Classic – 1/4 Scale Action Figure – Ultimate Deadpool is one of the most attention-getting items Marvel.com has seen of late, so we had to speak to Randy Falk, NECA’s Senior Director of Product Development, about the development of the figure. Marvel.com: This is the first-ever Ultimate quarter scale action figure NECA has done. What made Deadpool the right choice to debut this type of figure? 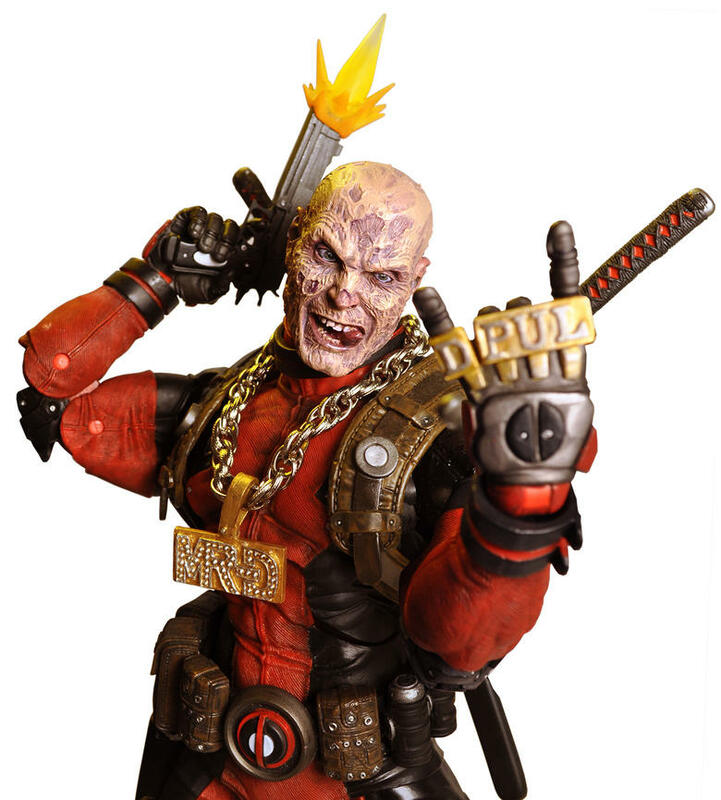 Randy Falk: Well, our Quarter Scale Deadpool is one of the best-selling figures we have ever done in that format -- Deadpool is a great character with a huge fanbase and it’s only got bigger and more rabid since the release of the films. It felt like the only choice for the format, with all the great accessories and items we could add to the character and the timing coinciding with the release of the second feature film. Marvel.com: The figure is massive, which is great for fans but I’m also guessing intimidating because they will be examining the detail so much. Did that really make you want to deliver on the final product? Randy Falk: We certainly strive to deliver the most bang for the buck in any format. When people pick up one of our figures, be it 8” or 18”, we want them to appreciate the value and see all the detail, all the deco, all the accessories and wonder how the hell we achieve all of that for such a low cost. First and foremost, we are all about accuracy and detail but at an affordable price so that most people can really collect and enjoy these figures without needing payment plans or a second income. Marvel.com: Let’s talk accessories, because this Deadpool has some amazing ones. Obviously, we expect his traditional weapons, but how psyched were you to make a figure that included a tiny unicorn and a chimichanga? Randy Falk: Very psyched! It was a lot of fun to put this one together. Early on in the process when we decided to tackle Deadpool as an Ultimate, I asked the sculptor, Djordje Djokovic, to make a list of stuff that he would like to include or that he thought worked well with the character and I did the same. We wanted to stay away from more weapons, since that’s been done a lot, and we really wanted to play up some of the more comedic aspects and just the “fun” of this character. Once we compiled our lists and determined what we could include based on costs and development time, we submitted to Marvel for approval and we were off. Marvel.com: How did you decide to include the Mr. D medallion and DPUL rings? Randy Falk: You know, that really came out of wanting to make people smile or laugh when they see that he even has the bling… like why not throw in all this stuff? Especially with the baseball cap, it just all works together and looks cool on the figure when he’s all decked out. Marvel.com: Obviously, you would want to have Deadpool in his famous mask, but you not only included an unmasked head, but also another with Deadpool’s brain exposed. Is that part of the fun of doing such an out there character? Randy Falk: Absolutely, and we even hid stuff in the exposed brain! Now the fans need to go looking and see what they can find. And yes, the band-aids were a fun thing to include too -- right out of the comic and onto the toy shelves. Marvel.com: The packaging is really interesting, with the transparent sides allowing you to see the two sets of accessories. Was there a lot of discussion on how best to show off everything this figure included? Randy Falk: Definitely. The packaging is massive and has the dual foldout function because we wanted to really go all-out with the box too. This is our first Ultimate figure in quarter scale and we wanted to offer something special that people will instantly take notice of. We spent a lot of money on this packaging and the slip cover and all the extras. And of course spotlighting everything that is new with this incredible set. The response from the fans has been incredible and Rob Liefeld has been a big supporter too, talking and tweeting about what we’ve been doing with Deadpool. 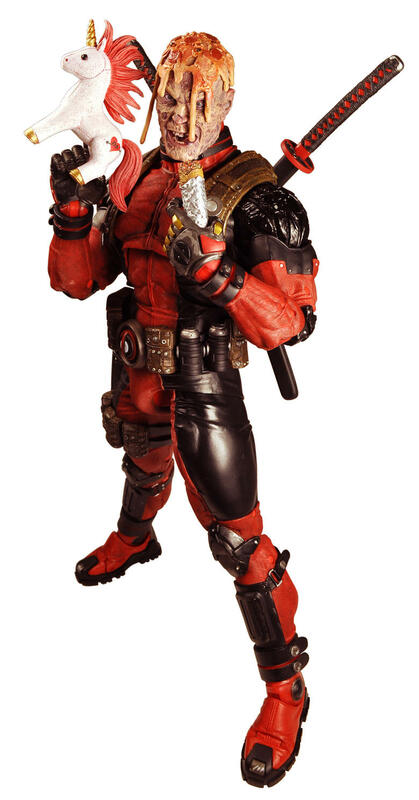 The Marvel Classic – 1/4 Scale Action Figure – Ultimate Deadpool is available now, including through NECA’s eBay store. Check out more photos of the figure and its packaging below!